Microsoft Office has always had a wide range of useful features which aren't always obvious to someone who hasn't had some thorough training on the product. In this article, we will go through a few ‘quick wins’ which are there to make life much, much easier when using Microsoft Outlook 2013. Sometimes, when you’re in the Outlook email tab and want to create a calendar appointment, it can be a pain having to switch the view. However, there is a quick and easy short cut to make life easier. 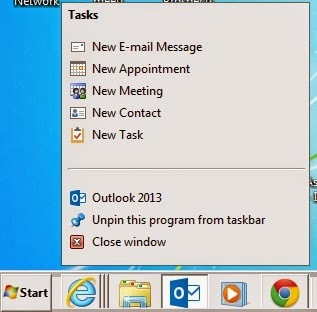 To do this, simply right click on the Office 2013 quick launch item in the task bar to reveal a list of quick tasks. From here you can create a new email, appointment, meeting, contact or task!! This is genius. If you send out a lot of emails which have similar content, or even if you always start your emails with the same introduction, then quick parts is just what you need as it will save you a lot of time endlessly repeating yourself. What you need to do is to create a new email and then type in the text which you use on a regular basis. Select the text by highlighting it and then in the horizontal bar at the top of the new email, select ‘insert’. In this new menu you will see a button called ‘Quick Parts’, click it and then select ‘save selection to quick part gallery’. Once this is done, every time you start typing the same text, Outlook will suggest auto completing it and then it will insert the entire section into your email for you. Sometimes you might want to compose an email but not necessarily send it at that time. You may want to delay its delivery so that it is sent at some point in the future. To do this, simply compose your new email as usual and then select the ‘options’ tab at the top. In the menu bar you will then see a button called ‘delay delivery’. In here you have the option to ‘do not deliver before’ where you can specify a date and time. Once you click send, the message will not go until the date and time you have specified. LinkedIn is the most popular social network platform for business these days, and many use it to communicate, generate leads and even recruit. One great feature of Outlook 2013 is that you can link it to your social media networks. What this means is that any and all communication via Outlook will now display additional information which is obtained from whichever social media account it is linked to, so long as the person you are emailing is one of your contacts. To set this up, in Outlook click on ‘File’ at the top left, then ‘account settings’, and the ‘social network accounts’, and you will then have a series of tick boxes which when ticked, will allow you to connect the selected account, once you have entered your associated user name and password. So, that it for now. There are many, many more excellent hints and tips which we may cover in future articles but for now, have a play around and hopefully this article will make your use of Outlook a little easier, and save you some valuable time.